The left continues to mount the case against Hillary Clinton. Michelle Alexander dismantled the Clintons' record on mass incarceration and welfare reform in an essay for The Nation and a number of Facebook posts. While activists are utilizing direct action to force Hillary to respond. Activist Ashley Williams, 23, attended a $500 a ticket fundraiser for Clinton in South Carolina on Wednesday. 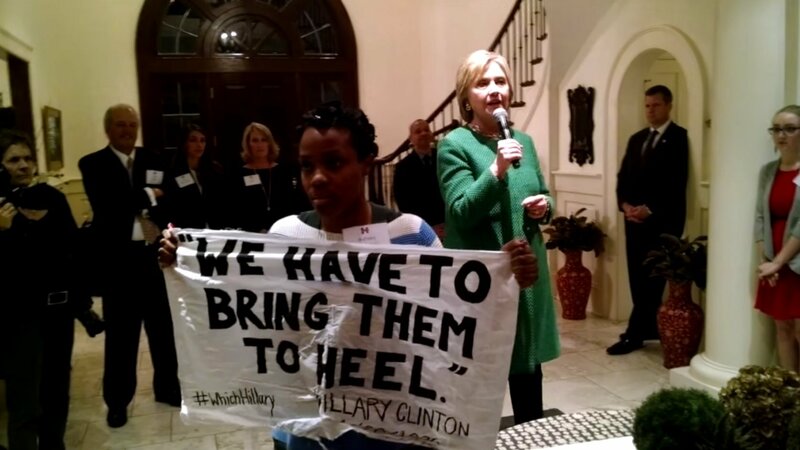 While Clinton was offering remarks, Williams held up a sign that read, "We Have to Bring Them to Heel." She asked Clinton, "Will you apologize to Black people for mass incarceration?" The activist also sought answers for a speech in which Clinton referred to Black teens as "super predators" in 1994. Hillary refused saying, "We'll talk about it later." The candidate seemed to take issue with the interruption. "Do you want to hear the facts or do you want to talk?" she asked. At this time, other attendees began to express their frustration with, "You're being rude." Within 90 seconds of the action's initiation, Williams was escorted out by Clinton's security. Williams told The Washington Post, "She’s had 20 years to respond to my question...And so her inability to do it last night to me is just kind of representative of how she has been absent in terms of racial justice in a meaningful way, in a material way."